WHEN DOES 1 + 1 + 1 = ∞ ? Whether you train kids, teens, adults or seniors the APT method works with them all. It doesn’t matter if the individual is sedentary and out of shape or a casual exerciser or even an elite athlete because APT teaches you numerous ways to scale exercise movements (from a solid biomechanical perspective) to make the exercise more or less intense or to focus on a different aspect (balance, proprioception, core stability, power, etc.). Whether you train clients indoors or outdoors; at home, in a studio or on the go APT works virtually anywhere. The approach and methods can be applied to all kinds of equipment options making it such a useful system to learn. We’ve all heard the old adage “Teach a man to fish and he eats for a lifetime.” This sums up the amazing possibilities that the APT method and tools brings. By understanding the 3 essential elements and the concepts in the APT system you will be able to create an endless variety of exercise movements that meet your clients and your goals. How to apply the APT methodology to any anchored training tool including any brand of Resistance Bands, Suspension Straps, Rip Tools, Landmines, Battle Ropes, Sleds and Cables. 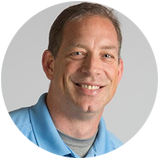 I am Chris Severs, creator of the Anchor Point Training method, certification program and exercise tools. Since 2008 I have been passionately dedicated to patiently developing a better understanding and tools for functional training with anchored resistance. During these years of evolution I’ve worked with dozens of regular “Joes”, older adults, dedicated athletes, trainers and coaches in Rugby, MMA, Boxing, Football, and Hockey. 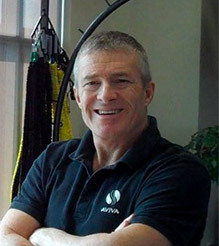 I’ve worked with Ballet Masters and Physiotherapists, Doctors and Gym owners. 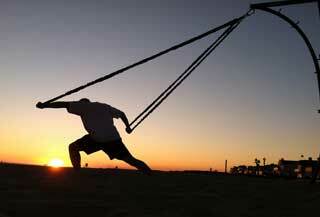 During these years I developed, tested and refined many generations of suspension and elastic resistance tools. This program is a culmination of many decades of sport, training, education and innovation. My understanding of training was driven by 40 years of competitive rugby. 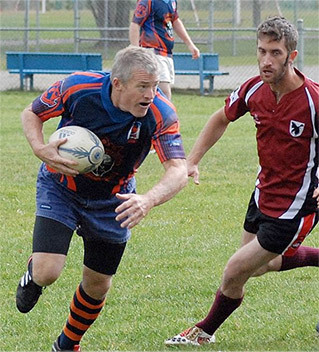 At the end of my rugby career I was recognized, at 56, as being the oldest competitive player in Canada. I learned a lot about functional fitness during these many seasons while rehabbing injuries and keeping my aging body athletic. I credit my longevity to training consistent variety in many functional dimensions. This is foundation of the Anchor Point Training methods and tools that I have developed. The strong fundamental benefits of Anchor Point Training (APT) make it effective, convenient, inexpensive and versatile. This approach is ideal for creating useful resistance for functional movement demands with anchored tools like suspension straps and resistance bands. By breaking down the capabilities of ANY anchored resistance tool into three simple elements you can create a virtually infinite variety of exercises to address all aspects of fitness, function and athleticism! My hope is that this program will open up worlds of possibilities for your training and will enhance your effectiveness with your clients! Remember, better is always possible! Wouldn’t you love to get out of the gym and train your clients on the beach or the park or in the woods? What about at home or in a hotel? The truth is that you can IF you understand how to use the anchors that exist all around you and you have the right types of tools. An anchor is simply a place to attach your resistance band or suspension straps. Cable machines, trees, doors, wall hooks….almost any solid, stable object can be an anchor. Whether overhead or underfoot or somewhere in between. Whether a single anchor point or two used simultaneously. APT will teach you how to anchor well for different equipment and different purposes so you can literally train anywhere at any time. Let’s face it, most people just grip and go. They pay very little attention to how they connect with the resistance and yet this is an essential element that can offer tremendous benefits if approached with a little more thought and appreciation. The connection point can offer both specificity and versatility to a resisted movement pattern. Whether we use bars, handles, belts, harnesses or straps matters. Whether we use double grip, single grip or prehensile grip patterns matters. These choices determine the types of specific adaptations that occur with training. Changing just the connection can have a huge impact on the nature of the exercise. APT explores these connection options and teaches you how to use them for versatility and specificity. Your stance, direction, distance and surface all come into play with your orientation to the anchor point. This is how you create useful resistance vectors. A vector is simply a force that has a magnitude and direction. Once we are anchored and connected we have a world of orientation possibilities that will significantly change the nature of the exercise and the results that are achieved. It alters which muscle groups are activated (or the order in which they are activated), what systems are stimulated (i.e. proprioceptive, balance, stability, fascial) and the level of intensity of the movement. APT will teach you how the orientation can enhance your efforts with your clients.